Transion Professional² is designed for use in beauty salons, spas and rehabilitative medicine. Using Transion Professional², you can offer your clients procedures for weight reduction and training muscles. 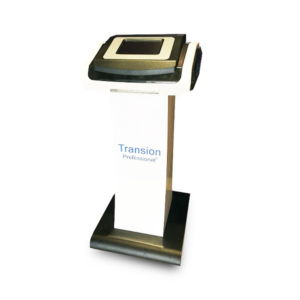 In comparison with the device designed for home use, the Transion Professional² device is equipped with more intense programmes and heating functions. Transion Professional² has 20 electrodes in the shape of rubber pads that send pre-set low-currency impulses to muscles, causing their rhythmic contraction and relaxation. Thanks to new software, client can now adjust strength for pads. Of course, the strength of each channel can be adjusted separately. When a muscle contracts as a result of a unique Transion stim signal, the chemical changes taking place within the muscles are similar to those associated with voluntary contraction in “normal exercising”. These chemical reactions results from muscle contractions utilizing glycogen, fat and other nutrients stored in the muscle. Moreover, the muscular workout activates the metabolic process using up the reserves of the organism. Since muscles need energy to perform movement, it immediately starts to burn the carbohydrates and fats. The procedure enables rapid elimination of excess fluids and soluble substances from the treated area. The excess fluids are put into circulation and eliminated in a short period of time, through the normal excretion system of the body. The result is an immediate decrease in size of the treated area, fat-burning, overall muscle toning and strengthening. Men and women can use the automatic workout of Transion on any muscle groups of the body, for example; upper arms, bust, belly, thighs, back, breasts and hips. For maximum results, we recommend to offer your clients the very least, the procedure consisting of 10 cycles. Before and after each procedure, be sure to drink, at least 0.5 liters of water. Just strap it on while you’re resting, reading, net surfing or watching TV and watch your body transform right before your eyes. 45 minutes can compare with 3 hours of real exercise in the gym. During the 19th and 20th century researchers studied and documented the exact electrical properties that generate muscle movement. It was discovered that the body functions induced by electrical stimulation caused long-term changes in the muscles. Luigi Galvani in 1791 provided the first scientific evidence that current can activate muscle. Recent medical physiology research pinpointed the mechanisms by which electrical stimulation causes adaptation of cells of muscles, blood vessels and nerves. Transion is the application of electrical current to elicit a muscle contraction. Contraction of the muscle with Transion is different than the typical or voluntary contraction of the muscle that is initiated by the central nervous system, (i.e. weight lifting). The nature and quantity of this work depend on the parameters programmed in the Transion device. Put simply, the Transion device can do what the brain is incapable of doing. While the brain is capable of stimulating a majority of muscle fibers, an Transion device can stimulate up to 100% of the muscle fibers (thus producing greater synchronization among fibers). Furthermore, unlike the human brain, an Transion device can deliver consistent and high quality impulses to the working muscles without inducing cardiovascular and psychological fatigue. This yields better and safer muscle performance results compared to voluntary training alone. The basic tool to make the muscles work is the electrical pulse. This stimulus is delivered from the Transion device to the muscle via the nerve fibers or the motor-neurons. The role of the pulse is to cause a response of the muscle by converting the nerve impulses into a muscular mechanical activity. This mechanical (basic muscular) response is called a twitch. Each time the electrical pulse is repeated, the excitation (or the initiation of the twitch) of the muscle occurs and the muscle twitch is repeated again. When muscles are stimulated with frequent impulses, the muscle fiber reaches the point of contraction when each twitch (basic response) has no time to end before the following excitation. Therefore, the muscle reacts with a constant contraction. This phenomenon is called tetanization and it is due to the summation of the basic responses. As the frequency (number of stimulations per second) of stimulation impulses increases, eachindividual twitch becomes less pronounced, up to the point of reaching contraction, and that is when the appearance of muscle contraction becomes smooth. The quality and quantity of the muscle work will depend on the programmed parameters and the intensity used. (Proper electrode placement also is a factor). The intensity (measured in milliamps or mAmp) is not preprogrammed, but is increased manually while the Transion device is on. The number of muscle fibers recruited that do the programmed work depend on the intensity of the device. If the stimulation is applied with a significant/high intensity level, a larger percentage or number of muscle fibers will be recruited/trained. Only the fibers recruited by the Transion will be worked and make progress. Contrary, low current intensity would result in very few muscle fibers being recruited, thus resulting in less progress. In general, it is wise to use the machine to start getting low intensity according to your needs gradually increase the intensity. Transion is a revolutionary muscle exerciser and slimming machine for use anywhere. It is a lightweight, portable electronic unit scientifically proven to exercise body muscles fast and effectively. During “voluntary contractions” which take place in your muscle groups during normal exercise, the brain sends a nerve impulse to the “motor point” of your muscle. This signal is a message to the muscles to contract and exercise. Conductive rubber pads are placed over the motor points of the muscle group to be exercised. When the passive stimulation is applied through the pads, the signal finds its way to these motor points and causes the muscle to contract just as if they received a signal from the brain. This makes it possible to duplicate conventional exercise with a Transion system to suit your needs. Most customers find the instructional manual with its various pad placements self explanatory. However, our consultants are available to give you a free demonstration and answer any of your questions. If you have more questions, please contact us thru our Live Support, call or write to us. Transion therapy is safe and reliable. The technology was developed over 30 years ago by a team of scientists and doctors. This technology continues to be used extensively in hospitals, physiotherapy clinics, health clubs and spas. The U.S. and Canadian track and field organizations fully endorse Transion technology and it has been recommended for use at the Olympics since 1972 by the medical advisory council to the Olympic committee. Is there any danger from badly-positioned electrodes? No. There is no danger if the electrodes are badly positioned. The stimulation will simply become less effective. Transion is the 21st century way of getting into shape that suits your busy lifestyle. Best of all, you can combine Transion therapy with another of your favourite activities – reading a book, meditation or watching television. It does not depend upon weather, availability of facilities or tremendous effort on your part to get and keep you in shape. User can see results with their very first treatments. Can Transion help sports injuries? Transion decreases rehabilitation time by controlling swelling and strengthening weak muscles. Used in conjunction with with the Transion frequency it also helps to reduce pain and greatly reduces an athlete’s injury recovery time. Can Transion help get my tummy back in shape after having a baby? Transion is ideal for tightening those post-natal bulges. Treatment should start approximately 6 weeks after delivery. Very gentle exercise to begin with, then gradually building up over a number of weeks. It is very effective in the battle of the bulge and love handles. How often I must use Transion to get best results? We suggest to use Transion at least 3 times a week and about 45 minutes for one treatment. What should I do before using Transion? Before you start to use Transioni be sure to read the manual and make themselves aware of contraindications. Just before starting the procedure is advisable to drink plenty of water (at least 3 glasses) as well as the benefit of the body’s water supply during the continuation of the procedure. Sufficient quantities of drinking water contributes to the excretion of poisons from the body, making the procedure more efficient results. Do I have to attend trainings after i start using Transion? All procedures for weight loss, including Transion procedures, assume that the person will continue to monitor the healthy lifestyle. In order to keep the results, it is important for physical activity and a healthy diet. Do Transion also benefit men? Transioni devices are intended for use by both men and women. Men and women having a different problem areas, but the results are the same. How long period of time i have the right to return goods? If you don’t like our device, then you can return it to us within 14 days. The device must be the same, and the whole package, and without defects. Please notify us by e-mail. Who can not use Transion? Transion must not be used during pregnancy, by epileptics, people with heart disease or pacemakers and have any metal plates or pins. You must also never apply the electrodes to the head and it is also recommended to avoid the area around the heart. If I wish to order device to another country? If you want to order in another country other than Estonia, please contact us so that we can specify delivery time.